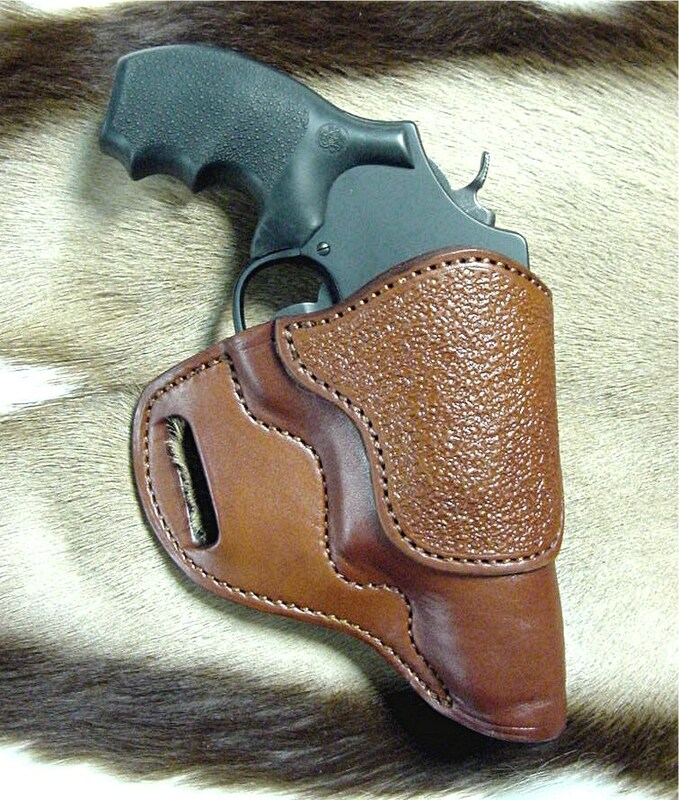 Many folks have asked us to make an Askins Avenger style holster for the new Smith & Wesson Governor revolver. After months of study and research we have collaborated with Adams and come up with this heavy duty and dependable holster. It is also available with a top security thumb strap. The Smith & Wesson Governor revolver has a full six round capacity, one more than the Taurus Judge. It can be loaded with .410- 2 1/2″ shot shells, .45 ACP with half or full moon clips or .45 Long Colt. Most folks do not know that you can also shoot .45 Auto Rim which makes this revolver able to smoothly digest four different types of ammunition. In addition, it is very lightweight and versatile. The barrel length is 2 ¾” which is one heck of a snub nose. Total length is 8 ½”. The sights are fixed, but appear to be well set for pistol range distance. It can be fired single or double action, which is very smooth right out of the box. The grips are spongy synthetic and absorb most of the recoil. The weight is only 29.6 oz. The cylinder and barrel are blackened stainless steel and the frame is Scandium Alloy. The gun is built on the (Z) frame, which is a stretched (N) frame and seems to also be available with a stainless steel frame. We have test fired this on a hunting trip in the deep woods and been able to consistently hit a paper plate at normal hand gun range. In every instance we were easily able to hit the target with all six rounds in all calibers. If you want a home defense gun that will not have magazine feed problems like a semi auto, use as a carry gun in your vehicle, or carry as a hunting companion we thoroughly recommend this revolver and the holster we make for it- you will not be disappointed. 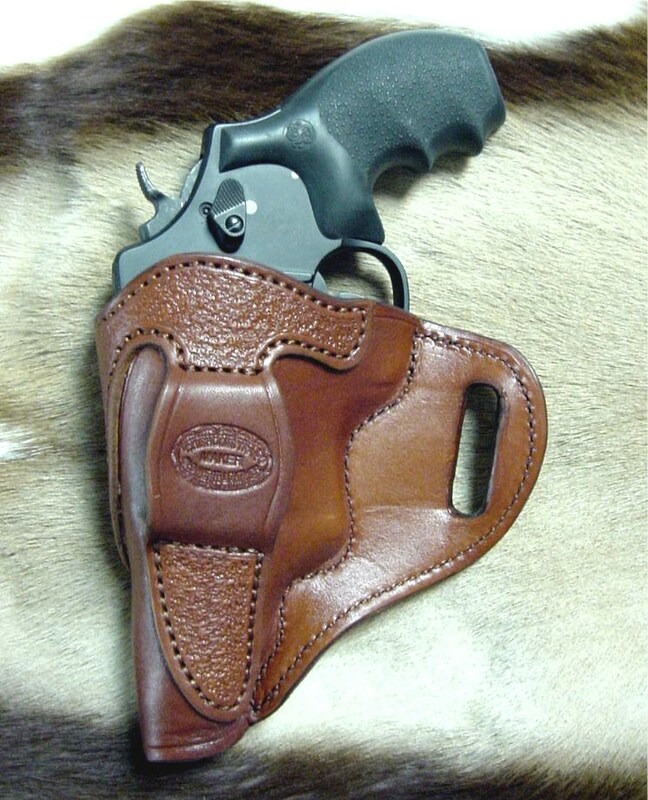 Call or e-mail us to order this holster. Check out our home page for color choices and other important ordering information. This shotgun has a Raptor bird’s head pistol grip, shaped to minimize recoil. After personally examining one, we found it has an ambidextrous safety on the top that can be used by either hand, two extractors, a steel-to-steel lockup, twin action bars, and an anti-jam elevator. We would recommend the aftermarket high rise steel safety, which is easy to replace with just a screw driver. To make this legal, A brand-new receiver is fitted with a pistol grip first at the factory instead of a shoulder stock or pistol grip. The 14″ barrel Mossberg 590 Shockwave with Raptor bird’s head grip gives the gun an overall length of 26.32″. That makes it a firearm not a shotgun. Do NOT make any alterations to this gun or change the grip or this gun will be illegal. Shockwave features are similar to the “witness protection” shotgun used by many agents. The 590 is tougher than the normal Mossberg. It is classed as Tactical and normally made for military and law enforcement. Now becomes the problem. No one previous to Chisholm’s Trail has made a leather or nylon carry scabbard that does NOT have the trigger guard exposed. We have had numerous law enforcement and military customers come to us and request a scabbard that covers the trigger guard and has multiple features. Our basic model has top and bottom attachments on the left side of the scabbard to carry it over your shoulder. The same attachments allow you to order an alternate drop belt loop and leg tie. Other attachments will allow you to wear it bandolier style on your left or right side for a cross draw with your right hand. We also offer attachments for MALICE clips to the back of the scabbard to secure to the reverse side of your backpack. Basic scabbard with two Malice clips ~ $174.95. Adjustable shoulder strap, drop belt loop, bandolier strap, and waist belt all available at an additional cost. Call and design your own scabbard. Heavy duty and ready for rough use- get yours now.